The REVO is the first and only bi-directional auto-locking belay device which provides a higher level of certainty that you will give and also get a better belay - indoors or out. 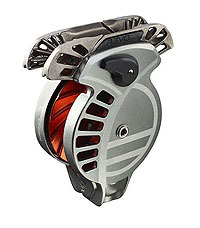 The REVO's design also assures you can't load the rope improperly... and that the locking function works regardless of the devices orientation or direction of the load. The REVO's primary mode works like any other friction device - to slow and then stop the rope's movement and arrest your falling partner - while your hand firmly controls the "slack" side of rope. It's secondary mode is activated when the rope moves at a speed in excess of 4 meters per second. This rapid movement activates an internal mechanism that locks the V-grooved wheel and stops movement of the rope. 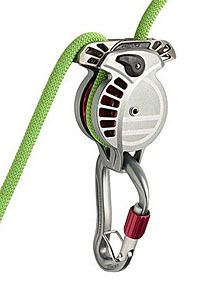 As such, the REVO's panic-proof locking mechanism cannot be over-ridden (and has no "release" handle) - so leader and belayer alike are assured any slip or fall will be checked quickly and held securely. This device is intuitive and simple to use. Letting out (or taking in) rope is smooth and easy, ditto for rappels. Can be used on a wide range of dynamic ropes from 8.5 to 11mm.